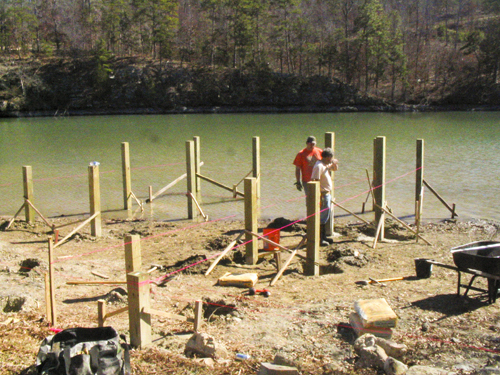 The annual drawdown is primarily to control aquatic weeds, but landowners can take advantage of the low water to build and improve docks. AGFC photo. The annual drawdown of lakes Hamilton and Catherine will be 5 feet this year. Both lakes will be slowly lowered from Nov. 5 through Nov. 13. Entergy Arkansas will gradually make these adjustments at a rate of approximately 4-6 inches per day. The water released at the dams will be used to generate hydroelectric power. Entergy Arkansas will return the lakes to their normal summertime levels in early March 2012. In addition to facilitating shoreline maintenance and inspection, the annual drawdown is part of a plan to help control nuisance aquatic vegetation. Entergy Arkansas coordinates the annual winter drawdown with the Arkansas Game and Fish Commission. Fisheries, vegetation, facility management and downstream water needs are the key factors considered in deciding the drawdown’s depth and timing. The annual aquatic vegetation inspection has identified a new non-native aquatic vegetation on Lake Hamilton called Alligatorweed. Originating in South America, it surfaced on Lake Hamilton approximately four years ago, but only recently started being a problem for some lakefront property owners. Alligatorweed is mainly found in shallow water and on shore and can spread through fragmentation. It is a vine-like plant whose leaves and ends of stems are generally on top of the water, forming dense interwoven mats. The lower portions of the stems are underwater, where they root extensively in the lake bed. Entergy’s aquatic vegetation management plan, which calls for the use of drawdowns of varying and alternating depths, has been successful in combating past infestations of nuisance aquatic vegetation such as naiad and water milfoil. Research indicates that control of Alligatorweed is difficult, and the use of drawdowns is not as effective. Management practices in Arkansas mainly consist of mechanical control and the repeated use of specific aquatic herbicides. The disadvantage of mechanically removing the plant is that it increases the risk of spreading it through fragmentation. Although Entergy does not endorse the use of aquatic herbicide to control nuisance vegetation, it is recognized as one of the options available. There are many laws and liabilities associated with the use of chemicals in public waters. Labels and instructions must be carefully followed. Extreme caution is urged when using herbicides in public waters. Entergy management recommends that anyone experiencing nuisance aquatic vegetation along their shoreline should contact the Arkansas State Plant Board to obtain a list of licensed aquatic applicators who can properly apply an aquatic herbicide on the nuisance vegetation. Boaters should use caution while on the lakes during the drawdown period because additional shallow areas will exist, and winter rains can increase the amount of debris washed into the lakes. Owners of boats and floating docks should also take precautions to ensure boats and docks are able to adjust to the drawdown. Failure to do so may cause damage to docks and boats. Some docks will be able to rest on the lakebed with little or no problem. If the shoreline is steep or rocky in a particular area, dock owners may need to temporarily move docks to deeper water. If relocating a dock, be sure it does not restrict navigation or become a boating hazard. Entergy Arkansas will not require a permit for the temporary relocation of docks due to the drawdown, but the dock must be returned to its permitted location once the lake returns to its summertime level. Entergy Arkansas also recommends using a licensed electrician to make any alterations to wiring in conjunction with the drawdown.